(l-r) John Varvatos and Ringo Starr at “The Peace & Love Fund” kickoff held at the Capitol Records Building in Hollywood, Ca on Monday, July 8, 2014. Photo by Angela Dawson/FRFW. HOLLYWOOD—Rock icon. Film star. Environmentalist. Philanthropist. 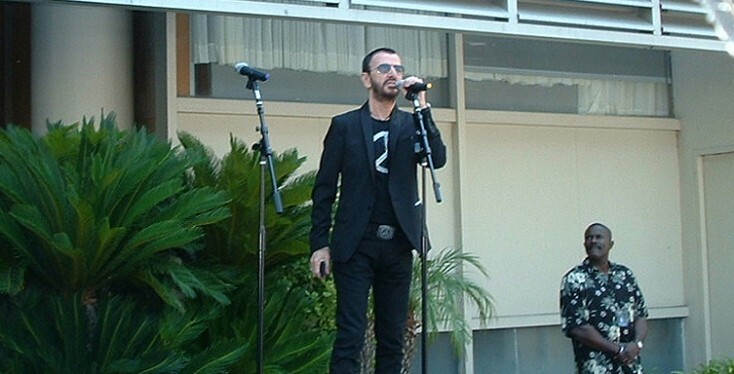 Now add fashion model to the list of Ringo Starr’s many hats. At a kickoff event Monday at the Capitol Records building here that coincided with the former Beatles drummer’s 74th birthday, Starr revealed that he will be part of fashion designer John Varvatos’ Fall 2014 advertising campaign. As part of the campaign, the designer is donating some of the proceeds to The Ringo Starr Peace & Love Fund, which is part of filmmaker David Lynch’s effort to bring Transcendental Meditation to at-risk groups around the world. Some 400 fans, friends and media outlets from around the world were on hand for the noontime event, which included a chorus of “Happy Birthday” from the attendees to Ringo, a group shoutout to “peace and love” and brief remarks by Ringo, Varvatos and Lynch explaining the initiative. The musician, dressed in all black, his shirt bedazzled in crystals forming a peace sign and wearing colorful tennis shoes, was presented with a cake. In return, the veteran performer, who is on tour with his All Starr Band, tossed black and white Peace & Love wristbands to very delighted fans. “He’ll be the face of the John Varvatos Fall/Winter campaign,” added Varvatos, whose designs are favored by many celebrities. Looking like a college professor with his shock of white hair and brown dungarees, Lynch took to the stage and said he was pleased his non-profit organization, which brings stress-reducing modalities for at-risk populations suffering from chronic stress and stress-related disorders, would be served by the initiative. 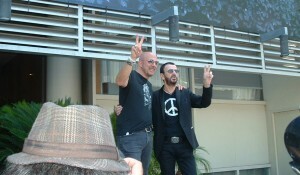 “Ringo Starr is Mr. Peace & Love,” he said. “He doesn’t just talk the talk; he walks the walk. He exemplifies peace and love. One of the things he does is support the David Lynch Foundation, so we can give this life transforming transcendental meditation for anyone who wants it in the world. To kick off the campaign, Ringo and Varvatos took a selfie and posted it on the Twitter account #peacerocks, followed by other pictures with other celebrities attending the event, including Ringo’s wife, actress Barbara Bach and musicians Joe Walsh, Don Was and others. For each #peacerocks tagged photo, $1 will be donated to the Peace & Love charity through the rest of the year. Additionally, “Peace Shops” will be activated where Varvatos merchandise is sold and 100 percent of the proceeds from a dedicated “peace rocks” t-shirt will be sold to benefit the charity. Also, as part of the initiative, filmmaker Danny Clinch has made a short film about the behind-the-scenes efforts to bring The Peace & Love Fund to fruition.